It is time that we address the elephant in the room. You know, the eyesore that plagues most family rooms across the country. That large, shiny black rectangle that so many of us dread dealing with in our design plans. We are of course talking about the television (dun-dun-duuuuuuun). Decorating around a TV can be tricky business. Fortunately, with the sleeker and thinner design of flatscreen TV’s our task is made much easier. 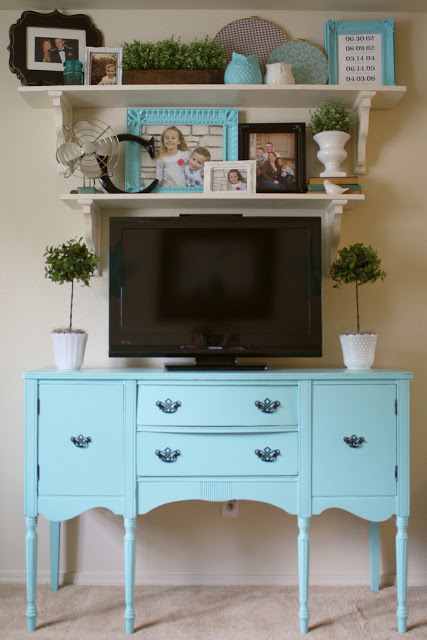 Let’s explore 5 tips for decorating around a television. Tip 1: Just hide it. Sometimes the best way of dealing with a design problem is to try and eliminate it. 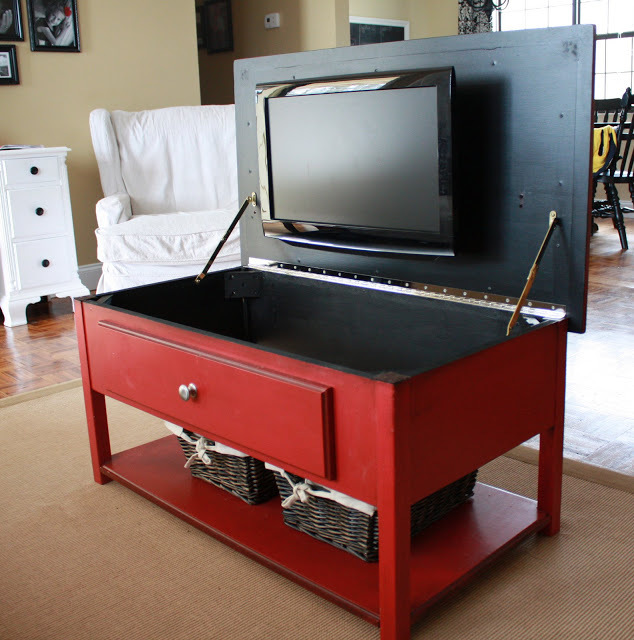 If you simply can’t stand looking at your TV find a way to hide it! 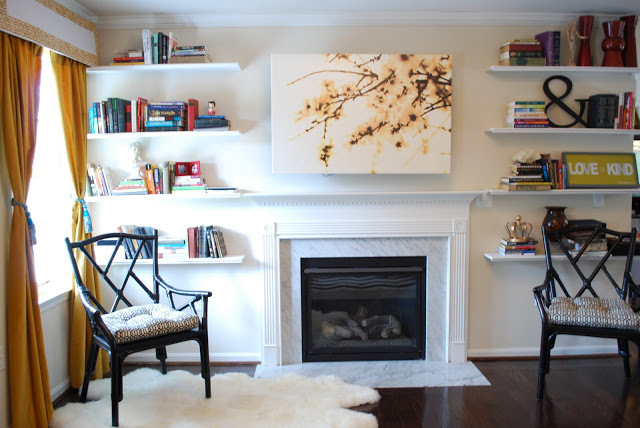 I love the idea of attaching a flatscreen to the inside of a coffee table, hiding it behind artwork, or hiding it behind custom sliding doors. These might not be the most convenient solutions for those with more complex television viewing needs, but for those who choose minimal screen-time these are fantastic and affordable TV-hiding-options. 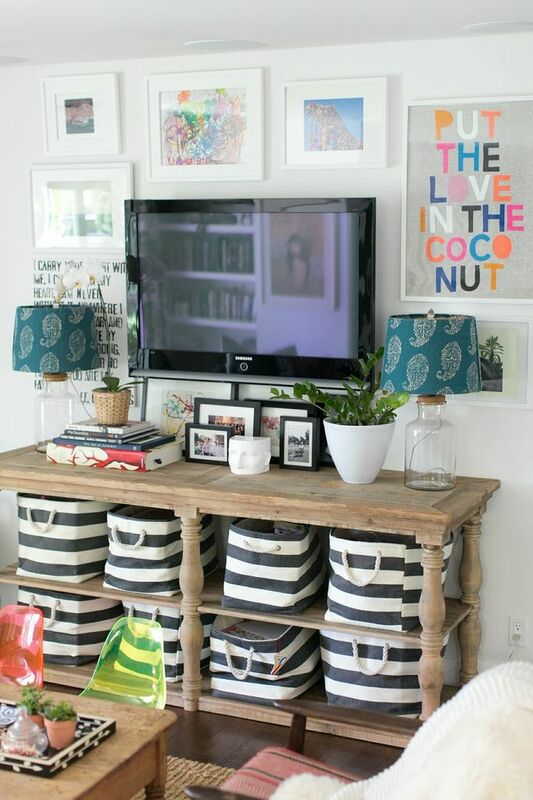 Tip 2: Use a vintage buffet as a TV stand. 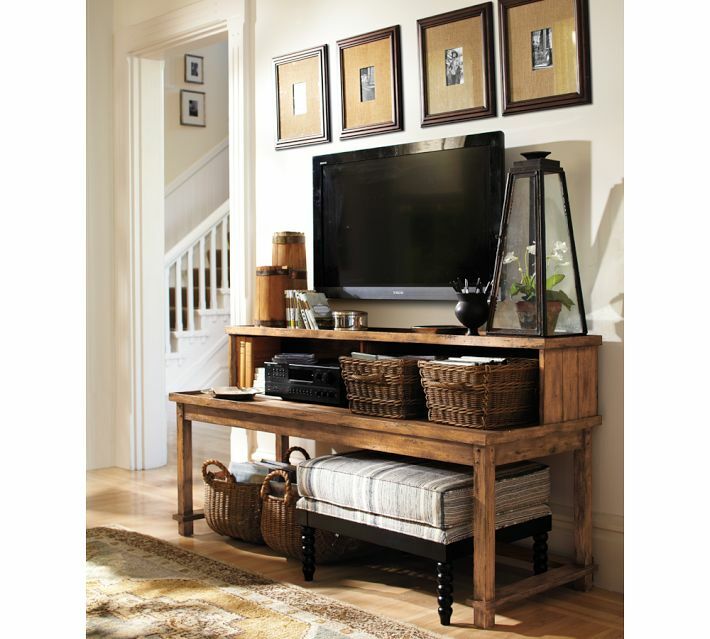 Whether you choose to mount your television, or rest it on a piece of furniture, opting for a non-traditional TV stand creates a more interesting focal point in the room. Look for vintage buffets and dressers at second hand stores, or on Craigslist. These pieces of furniture can typically be found at a cost much less than that of a new TV stand and add so much more interest to the room. Tip 3: Use open shelving under television. 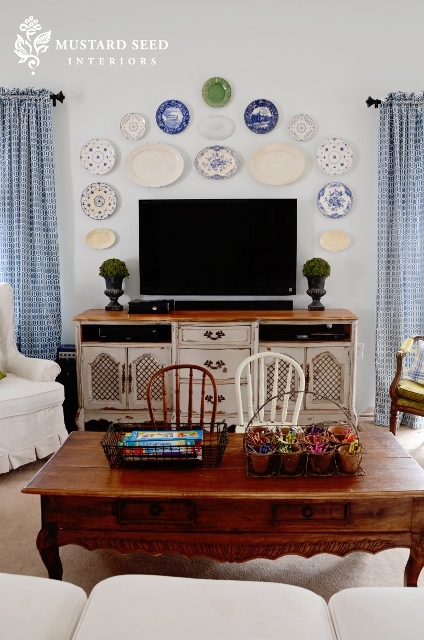 Decorative open shelving underneath your TV is not only practical, but when done right, eye-catching. 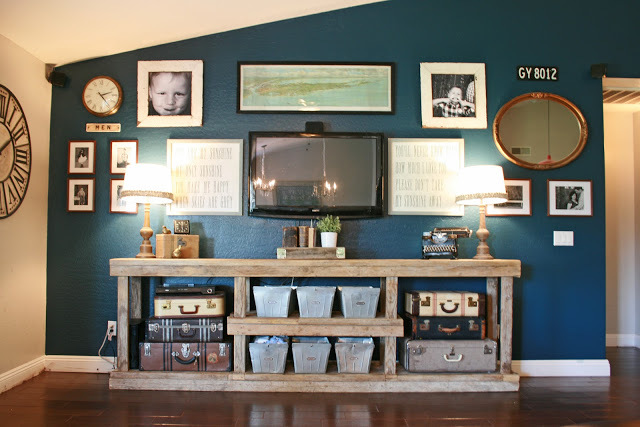 Hide discs, remotes, game consoles, and controllers in decorative baskets or vintage suitcases. 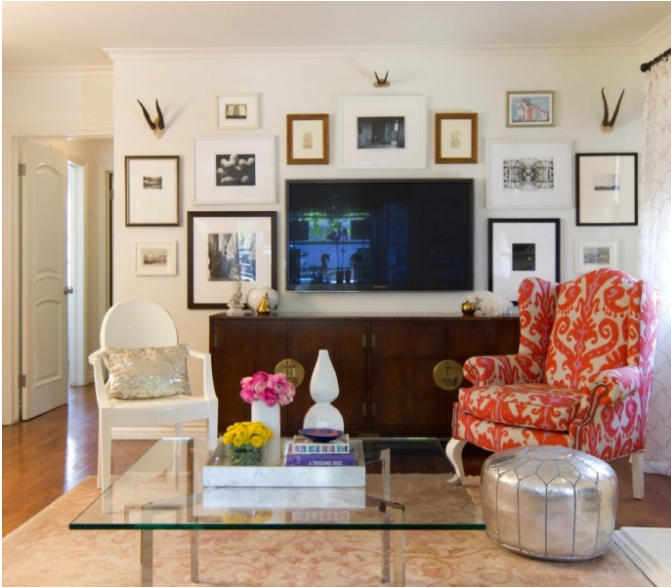 Tip 4: Gallery Wall: Surround your television with art & objects. I think this is the BEST tip of them all. 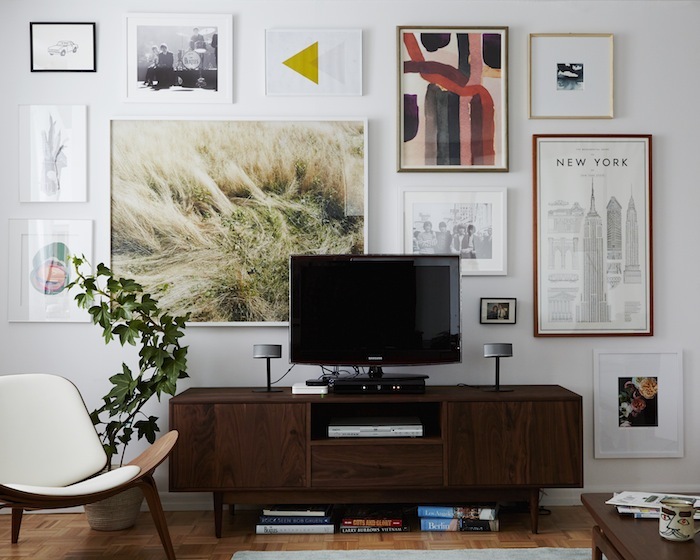 To help your television blend seamlessly with your decor, just embrace it as part of a gallery wall. 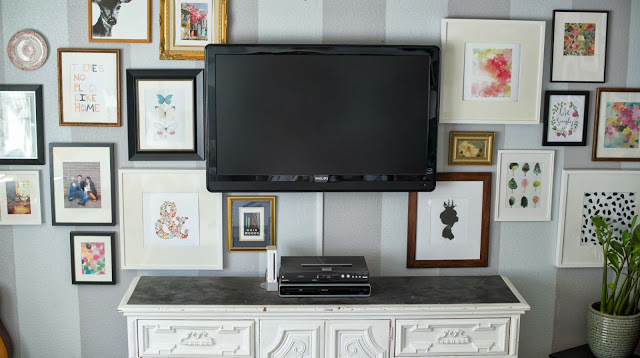 Surround your TV with meaningful art, family photographs, and collected objects. Your objects can be symmetrical around the TV, or free flowing, depending on the mood you would like to create in the room. 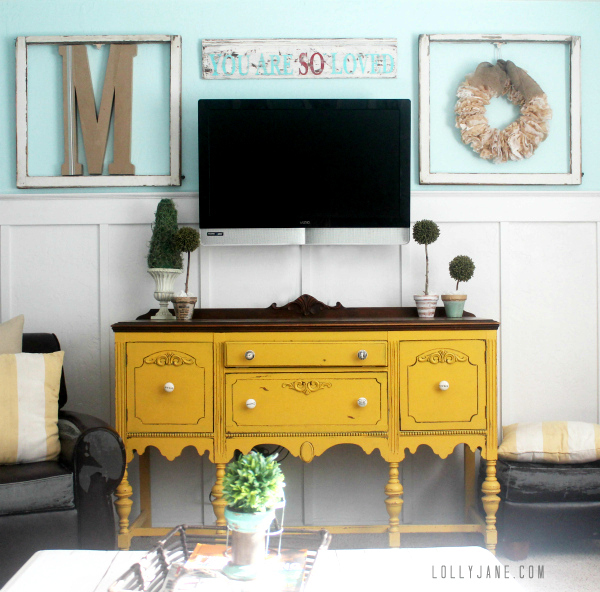 Tip 5: Put a frame around your TV. 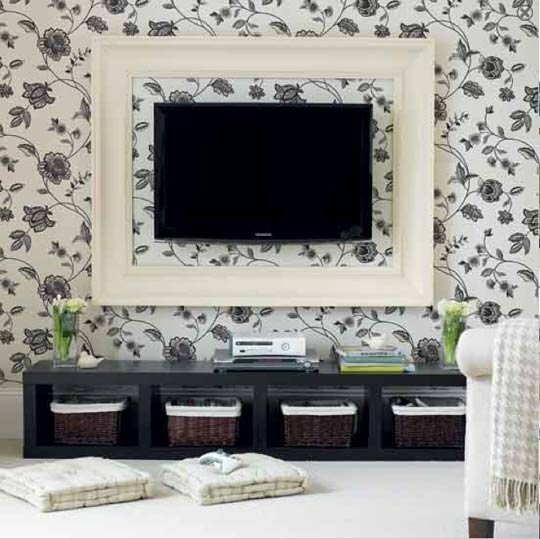 Placing a frame around your television is a great way to personalize your TV and help it blend in with your decor. 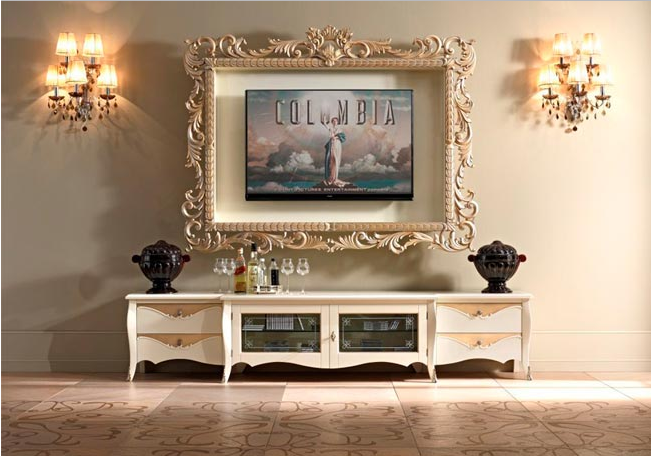 The frame can be larger than your TV, or can be customized to hug your television for a built-in look. I run a small hotel and currently, we are planning to buy some more TVs for the free rooms, and surely I would like them to be perfectly presented and decorated in the room. 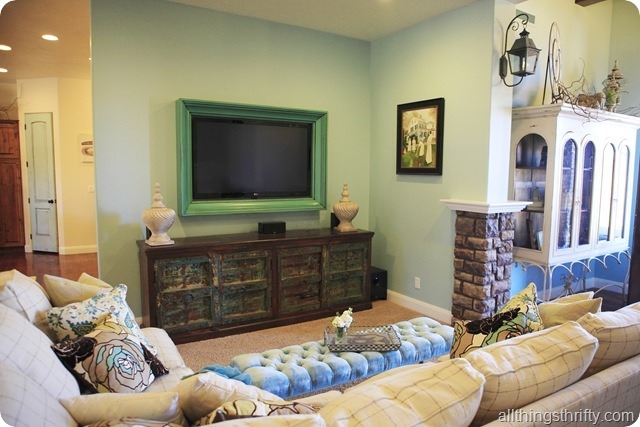 I liked the idea to surround the TV with art objects! I love Van Gogh and some of his pictures might look perfectly around the TV-set. Thanks! WHere did you find your white tv stand with the diamond pattern on each side? Hi Tabitha! This is a decorating round-up post which means I’ve featured some great ideas and projects with links to the original posts. Since these projects are not my own creation, I’m unable to answer specific questions. Please click on the blue links located underneath the pictures you are interested in to be taken to the original photo source. Thanks for stopping by! Where can I find a big white tv frame like that? Searching for a large frame at second hand store and painting it white is your cheapest option. You can also make your own frame from molding found at Lowes or Home Depot. If you’re looking to purchase a frame, first measure your TV and then search for frames that would fit around the exterior of your television. Great tips! I just did a gallery around my TV, and I’m so happy with how it turned out. Wow, I needed this post! Thanks Beth! Love the gallery wall idea. The tv is not mounted on the wall but I think I can create one around it to help it blend in better. What great ideas – I LOVE that oversized frame ( and the sconces on either side ) but you’d need a massive room for that one ! The open shelving is gorgeous too! These are really great ideas! I’m crazy about the vintage buffet and gallery wall ideas! Thanks for such an inspirational post! Fantastic ideas. 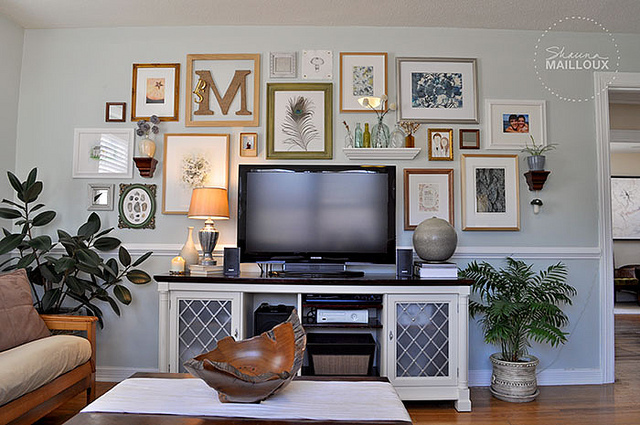 I love the gallery wall idea the best. Me too! I hope to incorporate one over our TV soon. We placed our tv over our fireplace and had a beautiful speciality framed mirror surround made. When the tv is off, it just looks like a mirror over the fireplace. A bit pricey, but so worth it to hide the obvious! I’ve seen those mirrors! And yes, I wish they weren’t so pricy, but it’s an ideal solution. Love this post! Thanks for including us! Pinned!! I had the same problem, just one TV in the living room… but what an eyesore! I decided to disguise it by decorating the wall behind it using floor to ceiling shims. It’s bold and it definitely draws your eye away from the TV.